The Lifjell massif is a true majesty, located in Hyllestad kommune at the northwest end of Sognefjorden - the longest fjord in Norway. The mountain is popular amongst hikers as well as climbers. 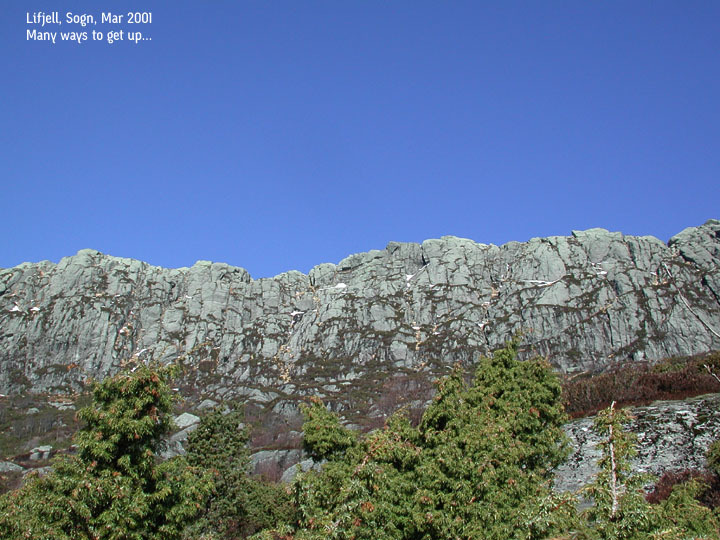 The characteristic Lihesten cliff is found on the east side of the massif, and is a popular motif amongst photographers. 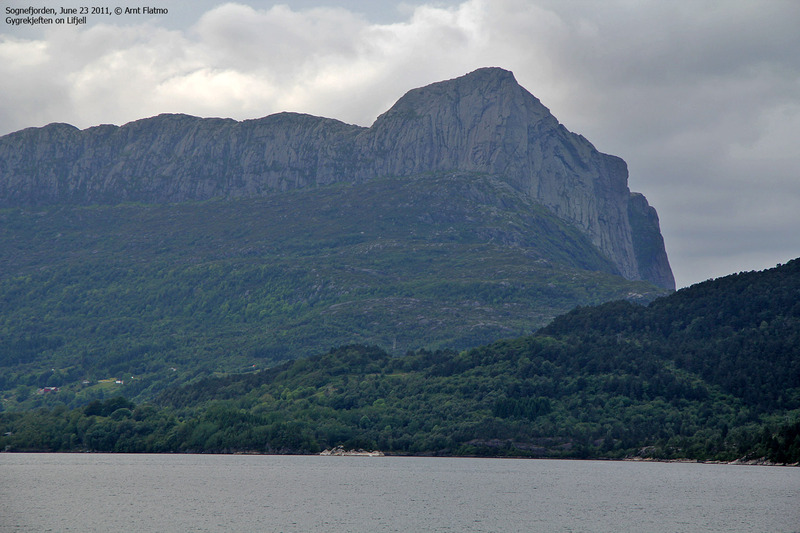 The cliff may resemble Prekestolen (the Preacher's Chair) near Stavanger. 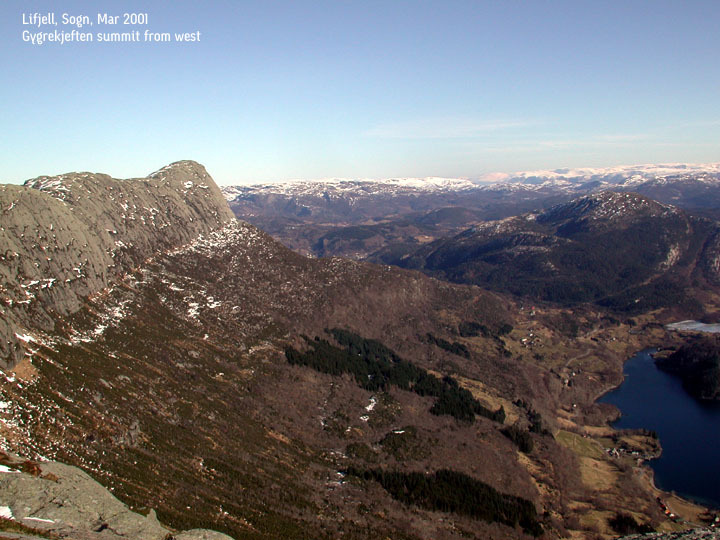 Lifjell is often used as a name of this massif that holds Risnesnipa (776m) as the highest point. 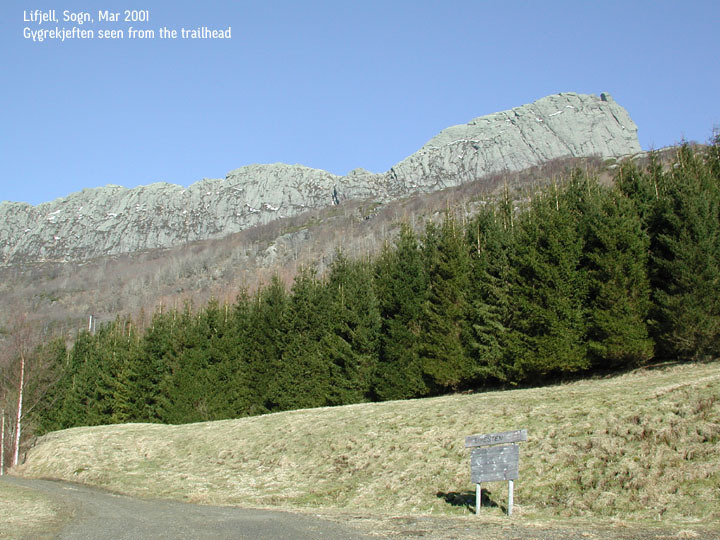 Gygrekjeften (710m) is another independent mountain (primary factor >= 100m) on this massif. Høgeheia (577m) is the third and last independent mountain on this massif. 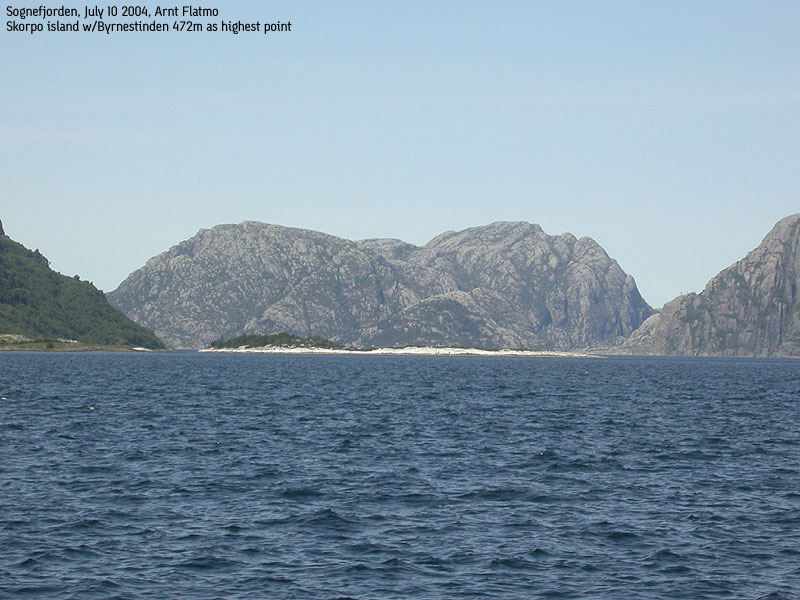 "Risnesnipa" (Risnes mountain) is located above Risnesøyna (Risnes island). "Lifjell" obviously relates to "Lifjorden", the fjord inside Risnesøyna. 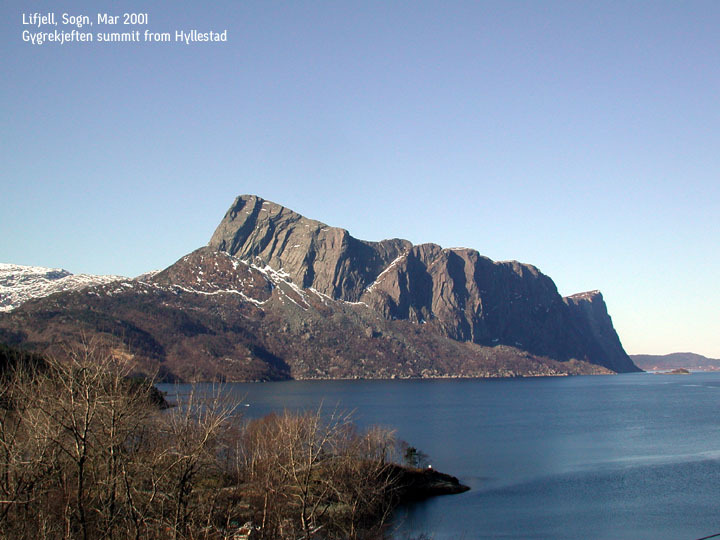 "Gygrekjeften" (The Gygre's mouth) has however nothing to do with fjords or islands. 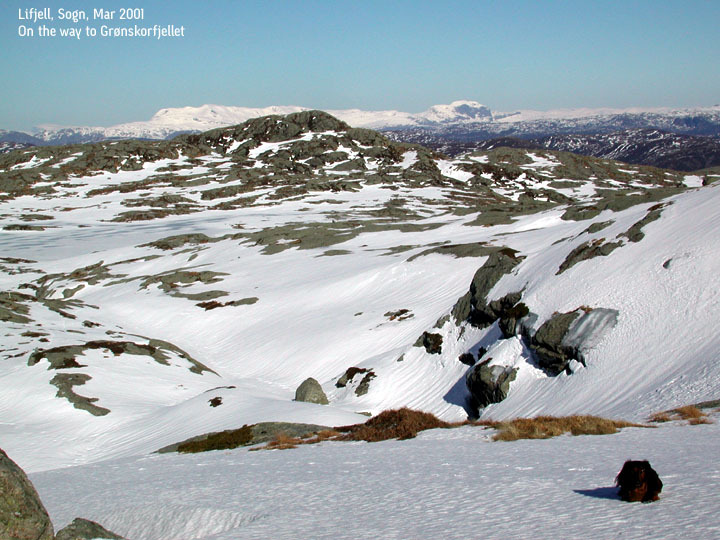 Gygren is a mythological female troll and is sometimes used in mountain names - Gygrastolen, Gygrefjellet, etc.) 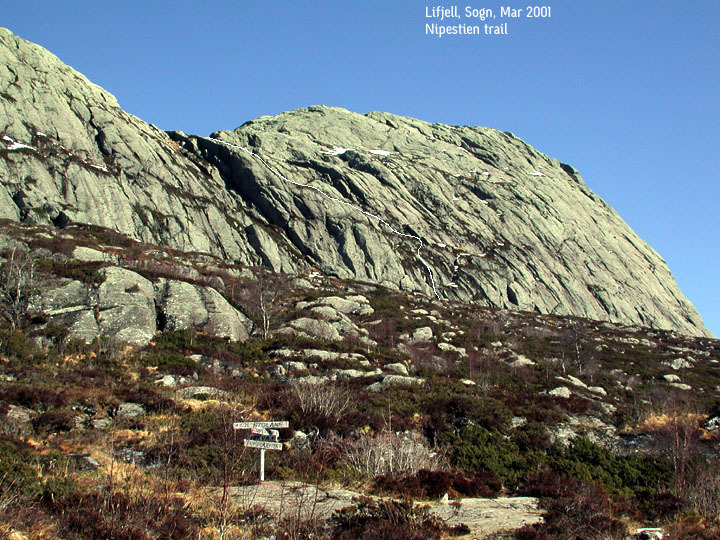 Perhaps the Lifjell massif's east side resembles a troll's mouth. I don't know. The massif is quite spectacular, having steep cliffs all around. There are four regular routes up the massif from the south side (where the road is). I will describe the two easternmost of the routes on this web page. Risnesnipa (776m) has a primary factor of 678m towards the higher mountains in the east. 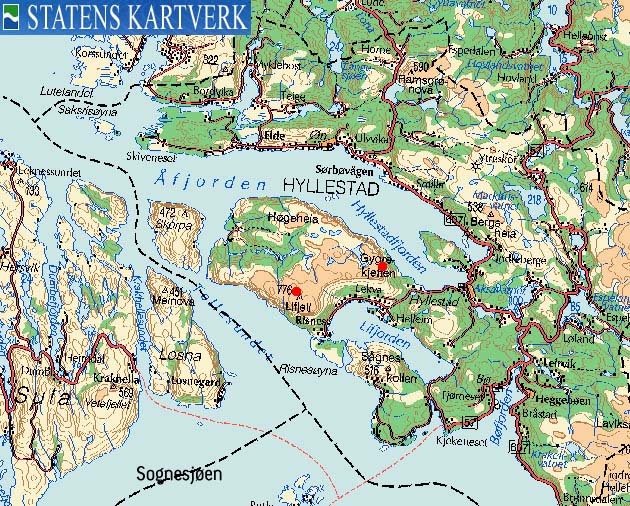 The saddle is found southwest of lake Nedrelireidtjørna (Ligreidvatnet on Økonomisk Kartverk). Ref. 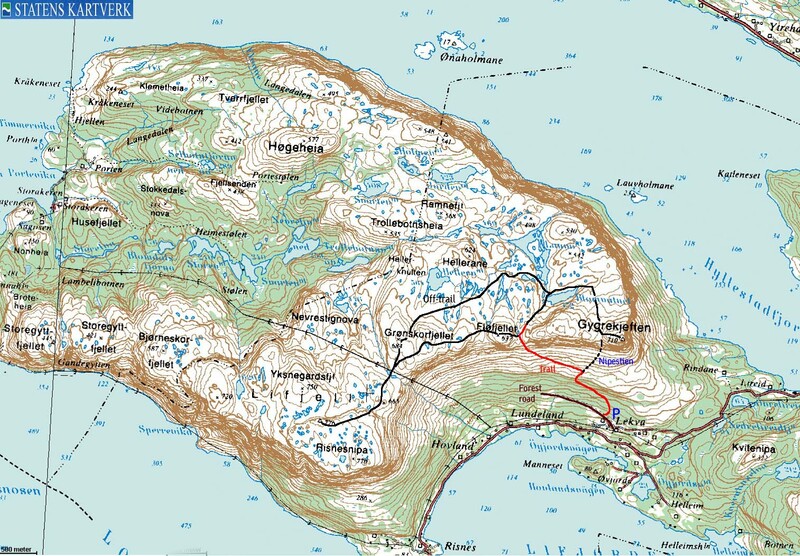 Økonomisk Karverk (5m contours), you cross the 100m contours on the high route, but not 95m. The saddle height is interpolated to 98m. 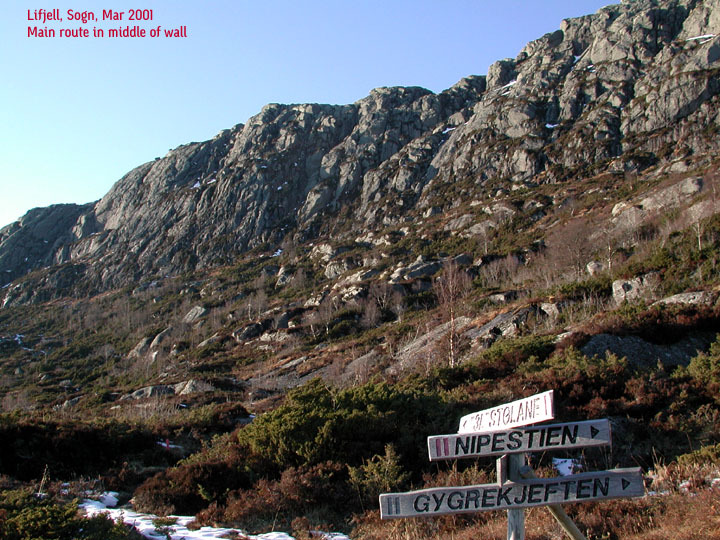 Gygrekjeften (710m) has a primary factor of 140m towards the higher Risnesnipa (776m). The saddle is found between Gygrekjeften and Fløfjellet. Ref. the M711 map (20m contours), you cross the 580m contours on the high route, but not 560m. The saddle height is interpolated to 570m. 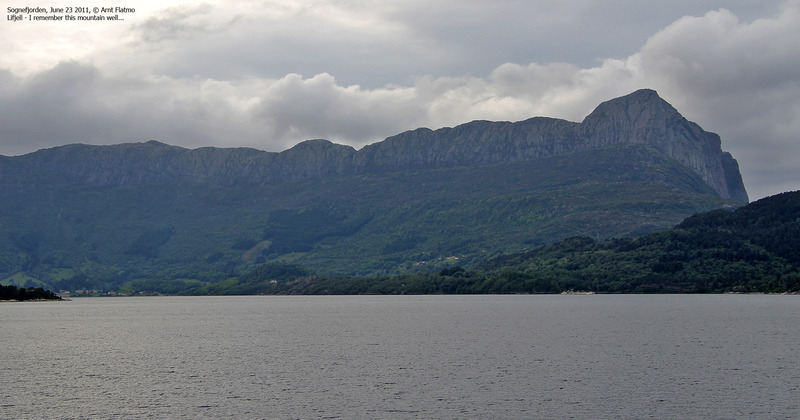 From Bergen, follow highway E39 northbound to Sognefjorden. Take the Oppedal - Lavik ferry. At Lavik, turn left onto highway 607. Drive through Leirvik and then a few kilometers before highway 607 takes a left turn towards Hyllestad. Follow 607 and not highway 57 which runs straight ahead. At Hyllestad, look for a junction with a sign to "Lihesten". Follow this road. 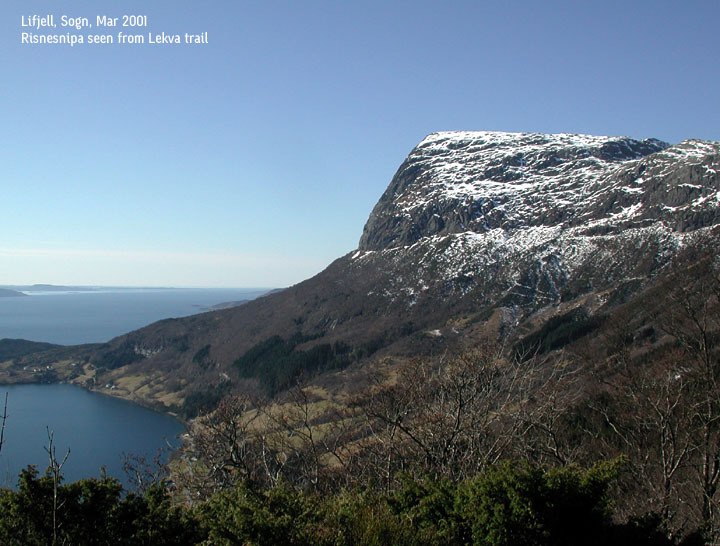 Drive along Hyllestadfjorden until you see a sign to "Lekva". Turn right onto this gravel road and follow it until you reach a parking area near a house. You're now at the foothills of the Lifjell massif. Expect 2 hours from Bergen to Oppedal and 30-45 minutes from Lavik to the parking. The ferry takes about 15 minutes. Driving distance from Bergen and back is approx. 275Km. Follow the forest road from the parking a few hundred meters until a trail forks off to the right. Go through a gate and follow a trail marked with red paint. You will arrive at a trail junction. The trail to the right is named "Nipestien". See the trip report below for a closer introduction to this trail. Turn left and follow the trail up the steep cliffs below Fløfjellet (Lundeland pass). The trail climbs up a couloir that runs up the cliffs. This route is not technically difficult, but your hands are required for support here and there. 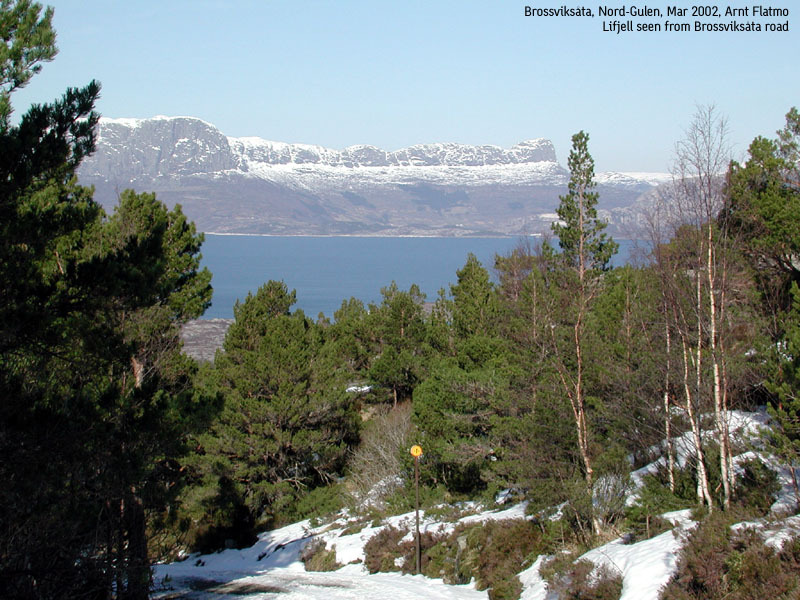 Once on top of this couloir, head northeast down to lake Blomvatnet and continue to the far east end of the lake before you head up to Gygrekjeften. There is no trail, but the terrain is fairly easy to follow. I recommend this route before a direct approach from top of the couloir you came up. There are some nasty cliffs on the mountain between Fløfjellet and Gygrekjeften. From Gygrekjeften, head back to lake Blomvatnet. Proceed westbound, staying south of Fløfjellet and Grønskorfjellet. Aim for the pass between Grønskorfjellet and Risnesnipa and find a good route up to Risnesnipa. Some routefinding may be required. You can take a direct route across Grønskorfjellet and Fløfjellet to the couloir where you came up. This was a hike I will never forget. I am writing this trip report 3,5 years later, because I never published what actually happened on the mountain. A beautiful week-end in March was coming up, and I decided to visit Lifjell. I didn't have a map, but had previously obtained a pamplet that showed there were 4 routes to the mountain. As I didn't expect to run into any snow this late in March, I decided to take the long drive up to Hyllestad. I left the trailhead 11:15AM and headed up a perfectly good trail. At the trail junction a bit higher up, the trail fork corresponded with my pamplet. I followed the trail going right - "Nipestien" trail. I was rather curious how one would get up these steep cliffs, and sort of felt that my question was answered when I saw a series of fixed ropes up the cliffs. I wondered if I should attempt this while carrying the dog. Obviously, Troll would had to be secured in the back-pack. I let him wait by the foot of the mountain while I did some test climbing. The pitches weren't long. And then there was always a ledge which would be a base for the next pitch. I decided to go for it. Putting Troll in the back-pack didn't work. Gravity almost sucked him out, and I had to climb with one hand on the rope, and the dog in the other. 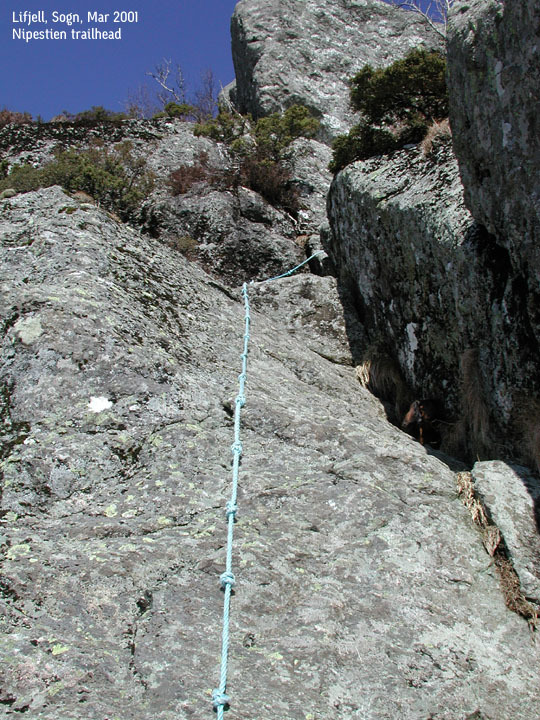 The method was pushing him towards the mountain, supporting him with my knees while getting a new grip on the rope. When the next ledge was within reach, I pushed him over the edge while yelling "Stay! Stay". I didn't expect him to go off anywhere, but dogs always do at least one round of rotation to become familiar with a new location. This made me a bit nervous. I made my mind up about finding another route when it was time to head down. Things got worse higher up. The ropes ended, and I didn't see a path. I started scrambling. The first pitches were easy, but then I really got tangled up in messy terrain. Troll was now in the backpack, which was good, as I needed all fingers and toes to climb up the mountain. 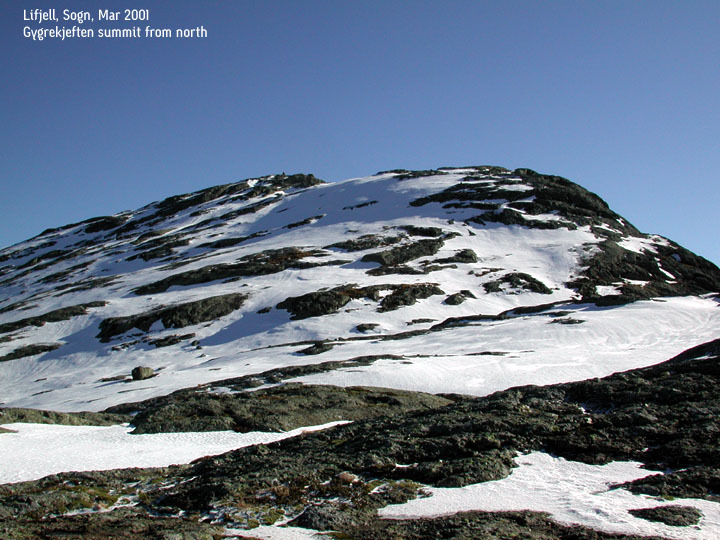 Except for the insane Slettmarkpiggen descent, this was the worst terrain I've ever climbed without a rope. But we made it up the cliffs. The next problem was that the hillside up to Gygrekjeften was frozen. I decided to give it a try. There was an odd naked rock here and there, which functioned as "base" for the next move. I climbed directly from the west, as a slide in any other direction would be incredibly bad. A slide down the west side would mean bumping into these rocks. This would also be incredibly bad. Suddenly I felt that I shouldn't be here. I just wanted to go home. However, I wanted to grab this summit before going home, and managed to kick loose two rocks which I served as ice-axes. A pair of crampons would have been incredibly useful, but here I was, on my belly, crawling carefully up an icy hillside with a dog on my back. We reached the summit 12:45PM. The views were impressive, but I wasn't in the mood to enjoy the scenery as much as I wanted to. I just wanted to get down. I downclimbed the hillside in the same fashion I climbed up. Very, very carefully. I was overwhelmed with relief when I got down to 600m elevation. I decided to explore one of the - according to my pamplet - two routes down from Risnesnipa. The fourth route - the one going left where I went to the right was not considered. It looked just as steep as the place where I went up, and I put all my bets on the west side routes. I hiked down to lake Blomvatnet and noticed a few cabins while heading west towards Risnesnipa. Since I was up here, I decided to climb Risnesnipa before looking for a way down. The terrain was easier. More snow, less ice. We reached the top 15:00PM. Evening was on the way. Time to get down. Once down from Risnesnipa, it didn't take me long to realize a descent from this side was impossible. Ice all around. Just attempting to explore the hillside down to Hovland would have been extremely dangerous. I could easily imagine that one could find summer trails here, but not in March. I came to the conclusion that I had a serious problem. I check my cell phone. Low on battery, but at least there was a signal. 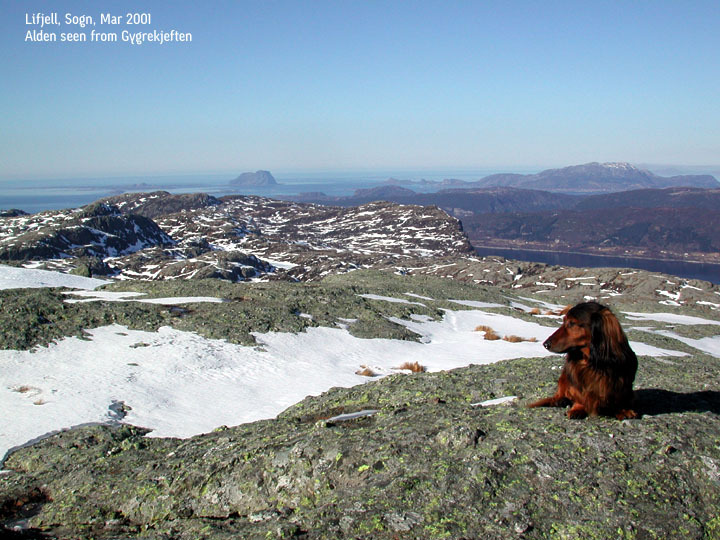 I had checked the cell phone on Gygrekjeften, only curious if there was coverage up there. There was none. There was still the 4th route to explore, on the east side. If I didn't find a way down there, it would have become dark, and I would have no phone coverage. I decided to make the ultimate phone call; "Hey mom! Don't get scared, but I'm stuck on a steep mountain in Sogn and Fjordane". I quickly explained the situation and told her to get in touch with some rescue group or the police. I didn't have the battery for many more calls. When I hung up, I was well aware of that getting help wouldn't be easy on a week-end's afternoon, a long way from Bergen. But 15 minutes later, the phone rang. It was the Balestrand police. I explained my practical problem. First they checked if I knew where I was. I told them that I knew this massif like the back of my hand by now. Except where I could descend. Then they asked if I had extra clothes. I reported that I was sufficiently equipped for spending the night up here. I had plenty of food and water, and even a blanket for the dog. They told me that they would try to gather a rescue party and come for me. I told them very clearly that I didn't want anyone up the mountain, in the dark, on my account. All I wanted was someone who could tell me whether there was another route or not. They hung up and told me they would see what could be done. I started to mentally prepare for a night out. It would at least be -10 deg. C. and I knew it would be damned cold. I planned to head for lake Blomvatnet and spend the night down there. This allowed me break a window on one of the cabins if the situation became critical. It was 15 creative minutes of emergency planning before the police called back. They had a local farmer on the phone. He told me to head to Fløfjellet and look for a marked route down a couloir. He wasn't quite sure, but believed this route should work. He hadn't been up this spring, and didn't know how much ice there was left. I ran across Grønskorfjellet and Fløfjellet and found the couloir right away. The couloir was icy, but I managed to get down in a safe manner. Once back at the trail below the cliffs I called the farmer. He repeated that I should go across Fløfjellet and locate a couloir. I told him that I was already down. He repeated himself before I rephrased myself. "I'm off the mountain", I told him. "That was - uh - quick", he replied. I thanked him from the bottom of my heart before I headed down to the car. 17:40PM, I was overwhelmed with joy when I opened the car door. I called my mom and told her that I was back in the lowlands.